Aiming to absorb the functions of my separate Internet router and Wifi Access Point to save 8W and shelf-space! Avoiding need to use the Family TV! As of 2018/07/13 I thought that my stand-alone Technicolor TG582n router had died, though it seemed OK again after several hours powered off. But it consumes ~8W and crashes about once per month. Also, since it is talking PPPoE (PPP over Ethernet) to a BT Openreach ECI Telecom ON316150 FTTC modem it doesn't need to do anything analogue, so the routing and filtering done by the Technicolor ought to be do-able by a Pi. Also the Pi 3 has on-board WiFi that can be used as an access point. With an RPi 3 B+ I ought to be able to ditch the TG582n router, save about 2/3rds of the power used by the networking gear, and reduce the number of system outages. Another advantage of an upgrade to the Pi 3 B+ is a bit more speed, and a bigger range of power draw to make better use of available sunshine, etc. Though I have to see if the base consumption of a stripped back Pi 3 B+ is still OK. Yet another advantage of an upgrade is moving to a newer OS distribution, allowing access to a newer Apache, HTTP/2, and various other goodies. So an RPi 3 Model B+ and mains and 12V power supplies and other goodies have been ordered from RS to get started. I'll record below as I prototype various aspects of PPPoE networking, new HTTP/2 support, etc. I anticipate a fair period of prototyping and testing before (re)building the production server. Starting with just the following RS parts, no keyboard or mouse or screen plugged in, and waiting for it to boot, settles to 2.5W power consumption measured at the mains. Directly plugging in the USB keyboard and mouse from a previous Maplin Raspberry Pi kit (R45Pi) raises consumption to 3.4W. Plugging in HDMI doesn't add any further load/consumption. Have logged in and changed the default password for user 'pi'. The Wifi does not seem to be in use to grab an IP (with DHCP) and get an Internet connection. This may be normal for NOOBS. Set the system to boot to CLI rather than desktop. Set GPU memory to minimum (16MB). Set WiFi country to GB. I am being asked to reboot for some of those to take effect. I am still being auto-logged-in, which on the console is probably OK.
ifconfig now shows wlan0, though not with an IP address. Following Setting WiFi up via the command line I sudo raspi-config and in "Network Options" enter SSID and passphrase. I exit raspi-config and ... I have an IP address on wlan0 and can ping the outside world! Security dictates that the very next thing to do is sudo apt-get update && sudo apt-get-dist-upgrade. Space used in the root partition is ~1GB. I have established that the RPi3 and WiFi are working. Also that power consumption is not outrageous even before any attempts to tune it. The next step may be to load up a minimal Raspbian, and (briefly) get the RPi3 talking PPPoE to my ISP and providing a WiFi Access Point. This would probably have to be a quick temporary swap-out with the current server, as none of the other services would be there, so there will be HTTP and mail server fails while the RPi is in place. I also have to provide down-stream wired routed (and NATted) Ethernet connections for devices that need it, such as my Loop and SmartThings hubs, and my new storage system. They may need some protection against external attack, and possibly against being used to attack other things inside the house. So I'll need to adjust my iptables config. As a first pass attempt to support the two downstream wired devices I have bought an AX88179-based USB-to-dual-Ethernet dongle (VTOP USB 3.0 Gigabit RJ45 10/100/1000Mbps Network Lan Adapter 2 Port) which both my Mac and the RPi3 appear to see immediately. I can't find a published power-consumption figure, so I will take some measurements in due course. None of the connections need run very fast, since the traffic from the devices is essentially only buffered telemetry. For the RPi3 the new ports show up as eth1 and eth2, so for robust and secure configuration of that and the on-board port I may need a UUID or other more robust identifier. On 2018/10/12 I ordered a 256GB Class 10 U3 micro SDXC memory card (Samsung MB-MC256GA Micro SDXC EVO PLUS Class 10 UHS-I U3, Amazon). The price was a little over £50+VAT. My choice was partly informed by Raspberry Pi Dramble's microSD Card Benchmarks. Given that the "... "lite" download is about half that size, for the entire OS. The full fat version is over 4GB" (Ken Hagan), I'm inclined to start with "lite" to save some of the new GB! So, from the Raspian download page I am pulling the "Raspbian Stretch Lite" "Minimal image based on Debian Stretch" with release date 2018/10/09 (kernel 4.14, 368MB, SHA-256 98444134e98cbb27e112f68422f9b1a42020b64a6fd29e2f6e941a3358d171b4) as a ZIP file. For lolz, I'm trying Etcher as suggested on the Raspbian page. Nice and simple, but warned me that 256GB was "unusually large" for it to Flash. I told it to go ahead anyway. The process was fast, and the card was left unmounted afterwards. 2018/10/20: I inserted the "Lite" microSD card into the RPi3, connected up keyboard, plugged HDMI into the family TV, and powered up. SSH host keys have been regenerated. Bluetooth service has been enabled (I'll most likely want to turn that off for security and power reasons). A message says that "Wi-Fi is disabled because the country is not set. Use raspi-config to set the country before use." I logged in as pi and changed the password. I should now be safe to connect up to the Intartubes and get updates, for example. I have changed the fstab parameters of the root filesystem to be defaults,noatime,commit=120 as on the RPi2 to reduce write traffic and improve performance, and rebooted. I may further raise the commit interval to 300s as on the RPi2's /local partition. I have set the hostname to sencha with raspi-config. I have set the Wi-Fi country to GB with raspi-config, connected to the Net with the correct SSID and password by editing /etc/wpa_supplicant/wpa_supplicant.conf with a 'network' entry with 'ssid' and 'psk' items. Then apt-get update and apt-get dist-upgrade to be up to date on security. At this moment, no updates were needed. I have set up NTP with apt-get but have not yet fully configured it (ie accepting defaults for now). At this moment, power consumption from the mains, with HDMI on, is shown as ~3.2W. The target is to get that as near as possible to 1W when idling without HDMI. 2018/10/21: I have fixed the IP address handed out by the router to the RPi3 with DHCP. This will mean that the RPi3 has a stable LAN IP address. That in turn should make accessing the RPi3 via ssh easier, thus avoiding conflict over use of the family TV as console! I also need to allow SSH to run on the RPi3 (with raspi-config), still at this point protected behind the firewall/NAT. I have created my user ID on the RPi with the same uid. I can rsync stuff across, repeating as I get close to bringing the RPi3 live. 2018/11/24: I have backported the LOWAT setting to the RPi2. Incidentally, reboots seem much faster than on the RPi2, <30s, possibly because of systemd which seems to be in this Rasbpian release. Added main a/c to sudoers, and will disable pi a/c in due course. The event service model seems to be enabled by default, as a module, (mpm_event) and its for this low-traffic low-memory server all its parameters can be rougly halved, to more like the RPi2 worker values. Other resource use may need pruning too. # which is waaay exaggerated when running httpd. # 512kB should be more than enough (AIX manages on 96kB, Netware on 64kB). Wall clock time taken by my ~2014 MacBook Air is a little under 7s, the new RPi3 ~20s, and the RPi2 ~44s. (Some of this may be due to a newer faster Java (JDK8) on the RPi3.) But in any case this RPi3 is much nearer to laptop performance than the RPi2. Set timezone to UTC and localisation to en-GB. (Done) Temporarily give RPi3 stable LAN address for setup work. Temporarily have Pi as Wi-Fi AP and client during set-up to avoid needing the TV and as a recovery mode! Tighten sshd security, eg limit users allowed and forbid password-based logins. Turn on anti-spoofing reverse path filters (net.ipv4.conf.default.rp_filter etc in /etc/sysctl.conf. Set up routing, NAT, DHCP and extended ipfilter/firewall local private LAN(s) wired and WiFi. Set up new local LAN with DHCP 'behind' RPi3; it may be possible to move Loop and SmartThings devices on to this new LAN well before rest of work is completed, and in any case they will buffer data through brief interruptions of connectivity. Get USB/Ethernet multi-RJ45 dongle for Loop and SmartThings hub such as CU200. Install/configure BIND and DNS master. (Done) Get swappiness right (1?). The RPi2 /etc/sysctl.conf has vm.swappiness=1 and vm.min_free_kbytes = 8192. (Done) Disable the ~100MB automatically-configured /var/swap swap file with swapoff /var/swap; systemctl disable dphys-swapfile; rm -f /var/swap. (Done) Increase ext4 filesystem commit time to 300s. Reduce syslog logging to reduce write traffic. (Done) Install NTP FCS/vanilla config. (Done) Configure NTP per RPi2 such as bringing low-tier servers over and adding some defence against misuse. The restarted with systemctl restart ntp. Try again to join UK (or Debian) pool.ntp.org service; traffic was overwhelming before but faster connection and CPU may help now. Install/configure hardware clock (spare device, new battery?). Turn off HDMI to save energy (~100mW) if no one logged in, per RPi2 rc.local. Set lower idling CPU clock to save energy (idle default apparently 600MHz, non-idle 1400MHz if not thermally throttled). Turn off Bluetooth to save energy (dtoverlay=pi3-disable-bt in /boot/config.txt or blacklist btbcm and blacklist hci_uart in /etc/modprobe.d/raspi-blacklist.conf and turn off Bluetooth services, eg sudo systemctl disable bluetooth and sudo systemctl disable hciuart?). (Won't do: all USB ports will be in use!) Selectively turn off some of the USB ports. Construct 2.5A (10.25W) capable supply from 12V. Testing with a Muker 10VA USB Multimeter Charger Detector (UT-KWS-10VA) shows red power light goes out when current draw hits as little as ~730mA (3.8W) from a variety of nominal ≥2A USB supplies, and also MacBook Air USB port. Minimum/idle consumption immediately after boot ~2W. Turn off other unnecessary h/w. Install and configure POP3 (dovecot?). (Done) Tune Apache for small-system memory and performance (roughly halved event mpm params and much reduced per-thread stack size). (Done) Use/configure Apache event model: event seems enabled by default and simply needs configuring. Initial tweak of mpm_event done. Copy Web sites (uid, data, cron) across from RPi2. Install/configure Apache w/ HTTPS and HTTP/2 support. Configure (Apache) Brotli support and static pre-geneneration. Capture (eg in SVN) config changes (eg for mpm_event). Copy existing user accounts (uid, data, cron) across from RPi2. Copy Gallery (uid, data, metadata, app, cron) across from RPi2. Set up extra log dirs for SunnyBeam, powermng, Enphase under /var/log. Copy power management code etc and move HATs. Install support for h/w RNG (rgnd / hwrng) per RPi2. Disable pi a/c in due course. Take snapshots of SVN repos, and archive some off-site. Copy snapshots to RPi3 and unpack. Switch RPi3 remote use of RPi2 to local file:// access. Copy appropriate rc.local features from RPi2 to RPi3 and capture in SVN. Capture (eg in SVN) /etc/sysctl.conf changes for TCP BBR/lowat/fq etc. Capture FCS and updated ntp.conf. Capture FCS and updated fstab. For significant applications added to the RPi 3, eg with apt-get or npm, a note will be made of what and when and why here. YYYY/MM/DD, apt-get/npm command, motivation and comments. 2018/10/20, apt-get install tcsh, because I like tcsh! 2018/10/20, apt-get install ntp, for good timekeeping. 2018/10/22, apt-get install cpufrequtils, for better power management. 2018/10/22, apt-get install apache2, for Web serving. 2018/10/23, apt-get install npm, for EOU and other purposes; followed by sudo npm install npm -g (twice) to self-upgrade. 2018/10/23, apt-get install zopfli, for EOU and other purposes. 2018/10/23, apt-get install optipng, for EOU. 2018/10/23, apt-get install imagemagick, for EOU. 2018/10/24, apt-get install procmail, for lockfile for EOU and others, 29MB of diskspace for this one utility executable! 2018/10/24, apt-get install subversion, for local (EOU/ExNet/etc) repos. 2018/10/24, npm install uncss -g, for EOU mobile and desktop pages. 2018/10/24, npm install purify-css -g, for EOU mobile and desktop pages. 2018/10/24, apt-get install libjpeg-progs, for jpegtran for EOU. 2018/10/24, apt-get install libfile-slurp-perl, to support jpegrescan. 2018/10/24, npm install jpegrescan -g --unsafe-perm=true, for EOU. 2018/10/24, installed https://github.com/MegaByte/jpegultrascan/blob/master/jpegultrascan.pl as /usr/local/bin/jpegultrascan.pl, for EOU. 2018/10/24, apt-get install clean-css-cli, not cleancss!, for EOU. 2018/10/24, npm install reado-cli -g, for EOU. 2018/10/24, apt-get install oracle-java8-jdk, for EOU and other uses such as the Gallery. 2018/10/25, apt-get install gnuplot, for EOU and other uses. Uses ~315MB of file space! 2018/10/30, apt-get install brotli, for future EOU. (A matching brew upgrade brotli (0.6.0 to 1.0.7) on the Mac changes the executable name from bro to brotli to match the RPi. 2018/12/31 PENDING, npm i -g cssgip, for future EOU image support. 2019/04/25: apt-get dnsutils, for dig. While on my RPi2 and Mac npm utilities have been installed in /usr/local/bin, for the RPi3 they've ended up in /usr/bin which mixes them up with system binaries and breaks a lot of my scripts relying on them being in the former. Pi Day came and went with no RPi 4 announced, bah! In early April 2019 the router went largely deaf, so that only devices very close to it could talk to the outside world, and started dropping external connectivity at random and for extended periods. The ISP ignored the most of the problem hard enough to let a couple of weekends slip by, including shipping a "drop-in replacement" router which was essentially unconfigured and not capable of replacing the existing device at all. Though its MD helpful was as ever, and offered to replace equipment at cost, since I have the RPi3, rather than spend over £200 buying a new router and spending time configuring it, I might as well strip down the RPi3 and try to configure it to do the job. If that doesn't work, I can splash the cash. So the RPi3 is going to be diverted to be the router and AP. Moving functionality from the RPi2 can happen by degrees if that all works. So another apt-get update etc, then turn off any unwanted services for the router. I'm not sure if I should leave an Apache running (supporting something static such as the exnet.com site). (Done) apt-get update and apt-get dist-upgrade RPi3 for security patches. (Done) Capture current line configuration including username and password. *** Capture current IP use on RPi2, eg for interfaces and Web sites and mail, NTP, etc. (Done) Strip down RPi3 to minimum services. (Done) Harden sshd, and reduce CPU impact (etc) of typical attacks. (Done) Plug in RPi3 eth0 port to spare current TG router port. (Done) Set temporary static IP address (in NATted range) for eth0 so that most of config including fowarding and NATting can be completed behind current router. (Done) Check log-in currently possible to RPi3 via WiFi and wired connections. (Done) Disable DHCP client on RPi3: sudo systemctl disable dhcpcd.service. (Done) Prevent DHCP client on RPi3 from attempting to assign an address to wlan0 by adding denyinterfaces wlan0 in /etc/dhcpcd.conf (above any other interfaces added there). (Done) Configure IP forwarding: add net.ipv4.ip_forward=1 to /etc/sysctl.conf. (Done) Provide static IP configuration for wlan0 in /etc/network/interfaces.d/wlan0 with temporary range 192.168.220.X, and reload interface with sudo ifdown wlan0; sudo ifup wlan0. (Done) Configure /etc/hostapd/hostapd.conf for wlan0 with temporary SSID and password and update /etc/default/hostapd to use it. Unmask and tentatively bring up the WiFi AP: sudo systemctl unmask hostapd; sudo systemctl enable hostapd; sudo systemctl start hostapd; the AP should be visible to WiFi users but not yet functional. (Done) Drop in IP filter to minimise attack surface and help with NAT/bridge based on WiFi Access Point rule set with some config from current RPi2 folded in. (Done) sudo service dnsmasq start. (Done) Reboot - at this point AP is up and running behind existing router. (Done) Plug VTOP USB-to-dual-Ethernet adaptor into RPi3 ready to accept Loop monitoring device network gateway, and one other as needed: appears as eth1 and eth2. (Done) In /etc/dhcpcd.conf extend denyinterfaces wlan0 eth1 eth2. (Done) In /etc/iptables/rules.v4 allow forwarding between eth0 and eth1/eth2 internally (copy wlan0 rules for eth1 and eth2). (Done) Provide static IP configuration for eth1 and eth2 in /etc/network/interfaces.d/eth12 with range 192.168.221.X and 192.168.222.X, and reload interface with sudo ifdown ethX; sudo ifup ethX. (Done) Move Loop device to eth1 and check able to phone home. (Done) Take all mention of eth1 and the 192.168.221.X range out of /etc/dnsmasq.conf. # Allow Access Point NAT only from wlan0 and eth2 (192.168.X.X). (Done) Have eth0 marked as 'manual' in interfaces/core. (Done) Change all eth0 in iptables to ppp0. Work out how to route static addresses though to (say) eth2. Tackle any remaining points above not done! So, annoyingly, I got a long way but not far enough. I can bring up my RPi3 behind the existing (fading) Technicolor and the RPi3 provides what seems to be a fairly decent WiFi access point and outward connectivity to the Internet. My existing RPi2 server sits in the Technicolor DMZ and presents services on its ~6 static addresses to the outside world. Very frustrating and if I could sort that then I’d have the whole thing done, I think. I’m a bit out of practice on knotty routing issues these days. There just don’t seem to be any good example of static public IP address blocks being routed to in this way with a recent Linux. I really don’t need fancy DMZ or NATting, and at a pinch the top half of the static address range may just have enough space for short-lease DHCP for our laptops, phones etc. 2018/09: How to Build a Low-tech Website? : "Being always online doesn’t combine well with renewable energy sources such as wind and solar power, which are not always available." How Much Power Does Raspberry Pi 3B+ Use? Power Measurements: "The thing that jumps out at you if you compare 3B+ with 3B is that it uses at least 170 mA more current – even at idle. This is due to the new Gigabit ethernet chip. I believe there will be a facility to switch this off if not used (at some point)." Pi 3B+ low power consumption: "The type of Ethernet connection and the mode with Gigabit Ethernet (EEE or not) are also important" (ethtool -s eth0 speed [100|1000] duplex full). Also note description on thread of how to turn off two USB ports which could be used to (eg) drop eth1/Loop loads and SunnyBeam overnight. Thread suggesting that "Amazon often co-mingles stock - meaning that their stock plus the stock of third parties is kept together and sold. So if an item is fulfilled by Amazon you may get it from Amazon's stock, or it may be from third party stock - this is how you end up getting counterfeit items ... " and that "...the common perception on Raspberry Pi subs is not to buy large SD cards online from places like amazon or eBay due to an epidemic of counterfeit cards. microSD Card Benchmarks: suggests Samsung EVO Plus or SanDisk Extreme are decent choices for RPi. How to overclock the microSD card reader on a Raspberry Pi 3: "overclocking tweaks that could help boost the speeds further for UHS microSD cards, allowing large file I/O speed to double, and random I/O to get a solid boost as well" using dtoverlay=sdhost,overclock_50=100. Review: Raspberry Pi model 3 B, with Benchmarks vs Pi 2. Raspberry Pi - Hotspot/Access Point dhcpcd method. Internet over ETH/PPPoE (Raspbian): suggests that eth0 should be in 'manual' mode. 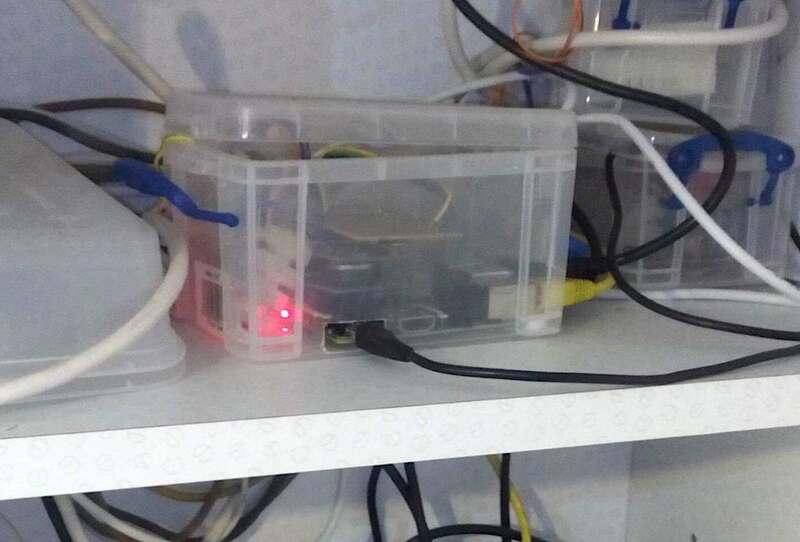 Raspberry Pi 3 as an emergency router. How to use Raspberry Pi 3 as a WiFi Router (with PPPoE) which refers to this tutorial. Raspberry Pi 3 as a Simple WiFi Access Point. 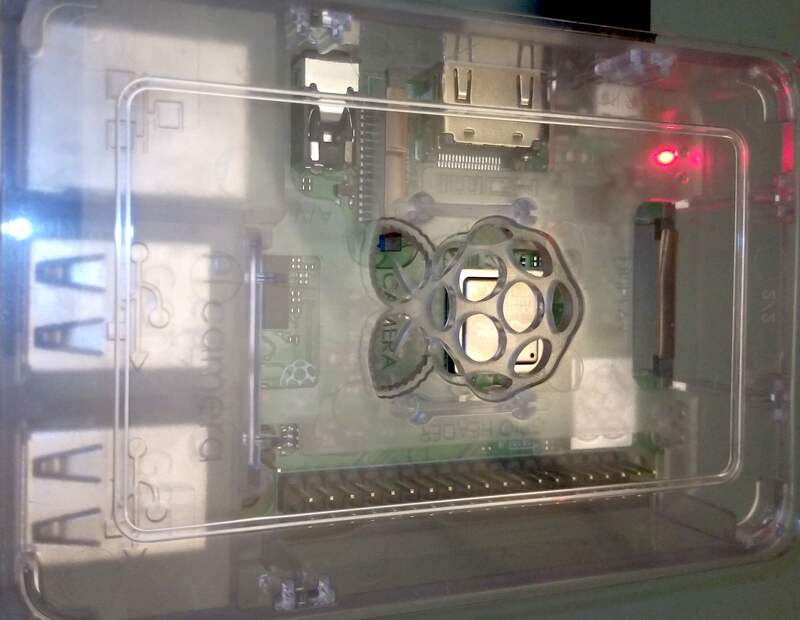 Setting up a Raspberry Pi as an access point in a standalone network (NAT). How to Turn Your Raspberry Pi into a Wireless Hotspot. How to Configure Wi-Fi and Bluetooth. Router:Linux - Debian: "... use a Linux machine as your router rather than an off-the-shelf piece of routing hardware. You'll need to use an ADSL or FTTC modem in bridge mode for this to work ..."
UBIQUITI Networks ERLITE ERLite-3 Edge Router. TP-LINK EAP225 AC1350 Dual Band MU-MIMO Wi-Fi Access Point, White. First published 2018-07-14 , updated 2019-04-26 . Site copyright © 2007-2019 Damon Hart-Davis. Hosted by ExNet.